Eva 7.5 is the bike for women who are ready to ride off the beaten path. This bike offers an agile and capable ride through diverse terrain types. From riding Deer Valley’s classic and twisted downhill riding to the wooded and flowing single-track of Duthie Hill Mountain Bike Park, this bike is versatile and helps the rider to adapt. The Eva is your vessel to new riding adventures and challenges. A woman designer created the Eva graphics, and colors were selected with help from our female feedback panel. Today, the Eva Line represents a new level of women’s critique, influence, and enthusiasm for the Raleigh brand. Many of the Eva components are women-specific. This includes saddles, grips with small diameters to better fit women’s hands and handle bar widths and stem lengths that have been individually selected for every frame size to ensure optimal fit and handling. 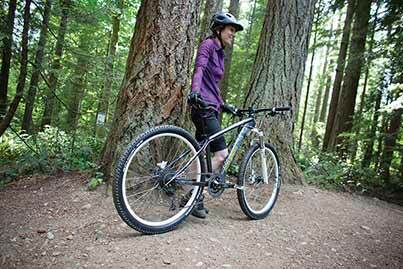 All of these things combine to make a complete, trail-ready package for women riders.